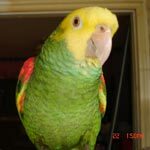 Parrot Forum • View topic - Can't keep newly flighted parrot off of me! Can't keep newly flighted parrot off of me! Re: Can't keep newly flighted parrot off of me! Definitely don't leave the bird alone in the shower. You don't have to get in with it and the shower can be brief. But then he will have to spend an hour drying off and preening and might be less clingy. I can definitely see though what is normally a "screaming" problem in caged or clipped birds is becoming a "clinginess" problem in flighted ones. They can fly after you so they don't have to scream for your attention. Yet still they don't want you to go or want to go with you. It's perfectly natural though that the bird wants to stay with you so this is a tough situation to deal with. One more thing you can try is to have a second person in the room (as a training session) and have them feed lots of rewards to your bird when you leave the room. Naturally you cannot train this yourself because if you're not there, it can't get treats. You can start with the other person holding the bird and holding its feet so it could not fly to you. Moment you leave the room, bird gets treat. Eventually the person shouldn't have to hold the feet. And soon enough the person should be able to stand anywhere in the room, you leave, person walks over to give bird treat. The initial training as you is quite simple. Sustaining this behavior on the other hand is a whole other story. I do have one friend that Mojo has really taken a liking to. That's a good idea and definitely one that I'll try next time he's over. I don't want my husband to be involved in any training that involves Mojo not being able to come to me or not getting to do what he wants. I don't know how that training will transfer to every day, but it doesn't hurt to try. I definitely agree about the clinginess problem! I'm happy that he's wanting to be with me but there must be something I can do to make being away from me more rewarding. Toys and treats haven't worked so far, I'll try 'drowning' him in attention tonight. I've tried calling him and playing with him until he decides to fly back to his perch but that usually doesn't last long. Hopefully changing the type of activity will help. I'll give everything a try for a while and let you know what seems to work and what doesn't. Thanks again! Hey all! So have you gotten any success thus far? I'm still having some trouble with my hahns glued to me. I have a play stand and i've tried a ton of things where she'd be able to hang out on or at but no matter what, she just keeps coming to me. I have to leave her in the cage as i play with my kids but much rather have her hang out outside of her cage and on a play stand or perch. Has anyone gotten any success with this type of issue? Well for dogs to learn "stay"
you have them stay and watch them till they're getting antsy before rewarding them. My "sisters parakeet" rarely makes noise outside its cage because it's just mostly allowed to be near her while she's doing something else,and chirps pretty loud when he wants to come out or when she's talking to him. For your Hanns you just have to be consistent. If you want to have her out then when she comes over to you and you don't want her just then put her back. Giving a treat or toy that can hold interest for a bit helps. Sense Alex is flighted if I'm not near his cage or playstand I take him off my shoulder and throw him towrds one of them and tell him go back. But I've been doing this with him for more than 2 years so he is much better about staying once I've had him step off onto his cage or throw him. But that is how I started him out. I would put him back with a toy or treat. I would go with a cool foot toy first (less likely they will fly to you just to get you to put them back for the treat). Now I can do it without anything. I am new to this forum but I have a baby 1 year old Senegal named Kaylee who loves to fly to me no matter what. I am a private music teacher and would love to have her stay on her stand so she can observe and be apart of the day but she keeps flying to me. I did start the "throwing" idea and would say "go home" she started to get the idea but I forgot to have her groomed and my finger is a mess from such sharp claws. I need to add some foraging to her stand with special treats inside so once she gets the idea that I want her to stay she has something to occupy her time with instead of flying to me. We'll give that a try. She is pretty tame and had some enlightening ideas recently after reading the Senegal Parrot and It's Family. I agree that I don't want to give her a treat after sending her back to her stand for fear it reinforce the flying back to get the treat. This was a great topic! It's nice to know our birds love us but it can't be a bad thing for them to learn confidence being off of us! I knew if I searched long enough I'd find something on the forum on this very topic. I'm looking for recommendations on this very subject. I see this is a very old post so I'm hoping there are even more recommendations on how to best address this. Our ARB is doing well with his flight training, but he no longer will stay put. He now wants to come to me all the time without waiting for me to gesture and call him. We is still working on flying back to his perch and he will do this for short distances, but we need to work on it more. Once he gets there he almost immediately wants to fly back to me, though. There are times when I just want him to stay put. What I've been doing most recently is also offering reward for "stay" command while on his perch, but with only limited success. I don't want to make this a long post, but for background purposes, he is a one year old African Red-Bellied. He came to us from a breeder about six weeks ago. He hasn't been clipped, but was previously not given opportunity to fly much and did so very poorly when we first go him. His flight abilities improve daily. He is starting to get much better lift and control. I should also add that when we are training I only reward for flying to me when called. When he comes without being called I take him back to his perch and we work on "stay." This may just be a short term training behavior problem and I'll keep working with him, but I'm just curious as to what others have encountered and how they might have handled this. I was glad to see Micheal had this issue at first and obviously overcame it with Kili. In my opinion, although this would appear to be a flight training issue and specifically one of targeting and recall training, it goes all the way back to training your parrot to be independent enough to entertain itself for periods of time when you are in the same room with it. I have two birds that are currently learning that they don't always have to be on or with me. The first is my Senegal and she is convinced that her place is either on me or next to me, but she has learned to fly to her tree or cage top if I ask her to go. I have not trained her to come when called as she doesn't often give me the chance. The other is my Grey parrot who prefers to walk than to fly and she wants to come to me and hangout with me. She has learned the word stay, but thinks that it means to stay on her cage until she is sure that I am not looking and then she can walk to me. I have always trained my animals to come to me when I call them byname or to stay where I take them and to go to their space when requested. These are life skills and not tricks as they make life with animals much more manageable. The training is simple enough, it just require patience, persistence and consistency. Take your time and be patient with the bird, be persistent in what you are requesting of them and be consistent with both how you ask for their cooperation as well as in the rewards for that cooperation and you will achieve the desired results. You tell a dog or cat stay. You tell a kid to stay here. Why not tell a bird. Myrtle is in the process of training my son to stay here when he has to leave. She has to be the worst to hang on me. She does not say real words most of the time but she knows them. I tell her fly or go away. When that doesn't always work I will fling her when I say it. She is a really healthy bird and flights like a fighter jet so it is okay with her. I would never do that to Rambo.